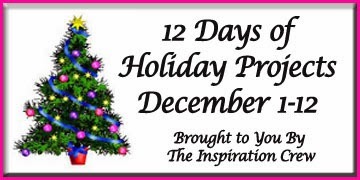 Welcome to Day 2 of the 12 Days of Holiday Inspiration Blog Event brought to you by "The Inspiration Crew". We’re just a group of online crafty friends who love being creative. This time we're doing a 12-day event to provide you with tons of Holiday Inspiration. Last year I purchased a set of 6 cute Christmas Buttons from Studio Calico. I never used them. So last week while I was on Thanksgiving vacation I sat down and challenged myself to make cards using all 6 of the buttons. To make the first one, I used Riding Hood Red cardstock to make the card base and papers from Echo Park Holly Jolly Christmas. On the others, I found I was too lazy to keep getting up for paper that is in the next room, so I ended up using the Riding Hood Red for all the card bases. I also used some holiday stickers I had from Echo Park and Cosmo Cricket and some border stickers. All from my stash. I used lots of different elements from the patterned paper, like decorative rows of graphics and sentiments. I did a lot of cutting. I tried to make them all different. Some I like better than others. The first one is my favorite. Here they are. Adorable! Love how you used the Christmas flair! Day 2 of following your *theme* is absolutely marvelous - and what a fabulous way to use the 6 flair buttons! Six cards of splendid delight! Cute cards and I just love how you highlighted that flair! Great job!! aww these are so sweet.. love all that flair..
Wow! These are great! Love the papers and design. Really great cards for someone like me that send out a lot! Lovin' the flair on them too! So cool! What cute buttons! I am all about using the stash of products that I've collected over the past 20 yrs. What adorable cards and hey, I see absolutely no problem with using Riding Hood Red on all the cards because it's such a festive color and I LOVE red! The little Christmas flair buttons are adorable! Such bright and colorful cards - you are inspiring me to work on using up some of my huge stash of crafting goodies. wonderful cards...they are all so unique. I like the last one with the snowflakes the best. Such fun and cheerful cards Donna! Great cards! Love all the fun holiday colors and prints! Great way to use these buttons!